New Guinea impatiens are generally easy to produce, however, many growers have difficulty getting the plants off to a good start. Growers have shown us New Guineas that appear normal but have made little or no growth following planting. Very often in these situations, disease, including impatiens necrotic spotted wilt virus, and environmental conditions are not the causes of the poor growth. However, frequently the level of soluble salts in the potting medium is higher than we would expect so early in the crop. Are New Guinea impatiens unusually sensitive to soluble salts level in the first weeks following potting? To find out, we planted cuttings of `Selenia' in 4.5-inch pots of Pro-Mix BX and fertilized the plants with Peter's 20-10-20 Peat-lite Special at 100, 200, 300, and 400 ppm N. A fifth treatment ("delay") consisted of no fertilizer for the first fourteen days after planting, 100 ppm N for the next fourteen days, and 200 ppm N till finish. Fertilizer treatments were made twice weekly and water was applied between treatments as needed. The experiment was terminated April 10 at 84 days after planting. A similar experiment was conducted between April and June to determine if the response of New Guinea impatiens to fertility rate and soluble salts would differ under higher light and temperature conditions; there was no important difference in plant response between the two experiments so only the earlier experiment is discussed here. Differences in plant growth between fertilizer treatments were apparent by about six weeks (42 days) after planting. At this time differences between treatments were statistically significant with respect to growth as measured by dry weight. As Figure 1 shows, growth of the young plants was suppressed at the two higher fertilizer rates, 300 and 400 ppm N. Soluble salts measurements suggest this was due to excessive buildup of soluble salts in the potting medium. Specifically, growth was reduced at soluble salts levels greater than 150 K x 10-5 (1.5 mmho/cm). Some plants receiving the highest fertilizer rates (300 and 400 ppm N) showed a mild yellowing which may have been a symptom of nutrient toxicity. Effect of fertilizer rate on the growth of New Guinea impatiens. Differences in growth rate between fertilizer rates became apparent 42 days after planting. Based on plant growth data, the delay treatment produced the most desirable results. Comparatively, the 100 and 200 ppm N were closest in growth response. The highest rates, 300 and 400 ppm N, resulted in a reduced growth rate. Branches were more developed on plants fertilized with lower fertilizer rates. 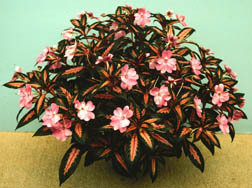 It is clear that New Guinea impatiens do not benefit from high fertilizer rates immediately following planting. A grower reading this article might say, "I don't use 300 or 400 ppm N on New Guineas, so how do the results apply to me?". The answer is that soluble salts can accumulate to excess levels for reasons other than fertilizer rate alone. Fertilizer application frequency, amount of leaching, and type of growth medium all interact with the fertilizer rate to contribute to the level of soluble salts in the potting medium. Application of slow- release fertilizers at planting and then applying water-soluble fertilizer or cultural practices designed to limit fertilizer runoff (ebb and flo, saucers, etc.) may raise soluble salts to an undesirable level as well. Common fertilization practices are often not specific with respect to application frequency. For instance, although the term "constant liquid feed" implies that fertilizer is being applied at every watering, it has also been used to describe application frequencies of once a week to only once per month. This study was conducted to determine whether the frequency of application affects the response of New Guinea impatiens to fertilizer rate. Plants were grown for sixty days and 100, 200, 300, and 400 ppm N solutions from 20-10-20 were applied the equivalent of 0.5, 1, 1.5, or 2 times per week. These frequencies translate into 4, 8, 12 and 16 evenly-spaced applications, respectively, of each fertilizer solution during the sixty- day experiment. Results suggest that application frequency has a distinct influence on the effects of the fertilizer rate applied to New Guinea impatiens. For instance, dry weight data showed that 8 applications of 400 ppm N produced similar growth to 16 applications of 200 ppm N. Frequent application of low fertilizer rates produced the best plants. When high rates (300 and 400 ppm N) were used, growth was best with a low frequency (4 or 8 times) of application. In most of the fertilizer treatments, there was a point beyond which increasing the number of applications was no longer favorable to the growth of the plant. However, for plants treated with 100 ppm N, 16 applications (twice weekly) resulted in the greatest growth of all rate and frequency combinations. It would be interesting to see if growth would continue to increase with even more frequent applications of 100 ppm N. With 100 ppm N soluble salts were well below the level 150 K x 10-5 regardless of application frequency. Soluble salts increased with application frequency in the other treatments. During the first 6 to 8 weeks after planting, 100 or 200 ppm N from a complete NPK fertilizer are good rates for New Guinea impatiens. If a slow-release fertilizer is applied at planting or shortly thereafter use no more than 100 ppm N. An acceptable alternative would be to hold off fertilizer for the first two weeks, apply 100 ppm N the next two weeks, and 200 ppm N until sale. Monitor growth medium soluble salts during the early growth period (first 6 to 8 weeks after potting). Learn to do a soluble salts test or send a growth medium sample to a soil testing lab. During this period a soluble salts level of 150 K x 10-5 or higher by the 2:1 extract method indicates the potential for growth inhibition of New Guinea impatiens. The authors wish to thank the Massachusetts Flower Growers Association and Paul Ecke Ranch for their support of this project.